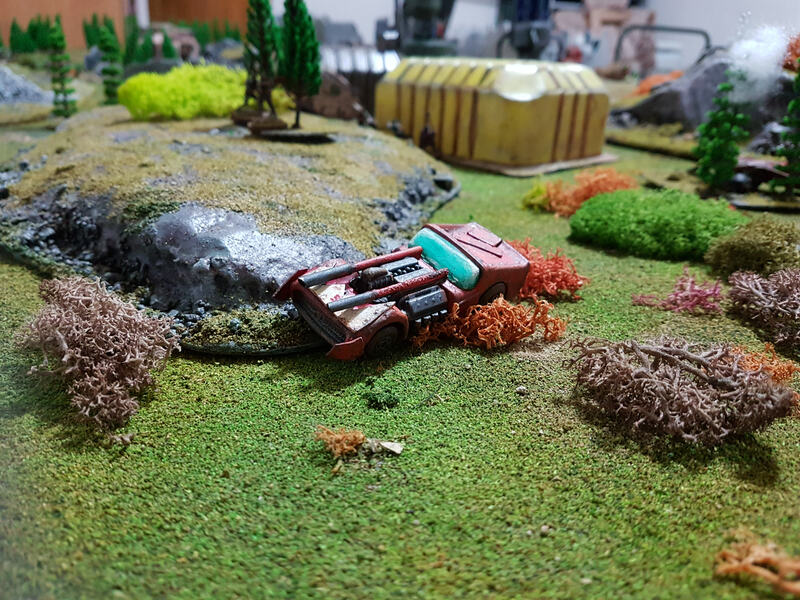 It’s the half term break here in Ye Olde England, so our little group has been able to cram in a little more game time than usual (yep, the teaching profession has its upsides..).. Our regular readers may have noticed that we’ve gone for a bit of a fantasy vibe recently, turning the Apocalypse: Earth game mechanic to new pastures. The world of Hyperia, mankind’s new home across the stars.. colonised by refugees from a dying Earth more than twenty centuries previously, mankind has learned to abandon the crude technology of its past, embracing Vril and Magick.. mankind has learned to coexist with the native Stoc’d and Ee’la races, and help them face the Terrors that inhabit the world’s core. But as is the way of mankind, we cannot remain united for long.. now across Hyperia, different realms do battle for the precious resource of Vril. To the West, the Grand Alliance commands a network of skyways and oceanic shipping lanes across its network of islands. Mighty skyships ply their trade amidst the islands, archipelagos and vast floating cities of a thriving economy with new inventions pushing technological barriers every day. Their elite Sky Marine Corps are the envy of every power on Hyperia. But the Alliance is built on the vital resources of liftwood and Vril, and both of these are becoming rarer by the day. On the central continent, the realm of the Ancient Regime holds sway – their ruling families tracing their roots back to the original colonists who crashed to Hyperia on the fateful day that brought our race here. 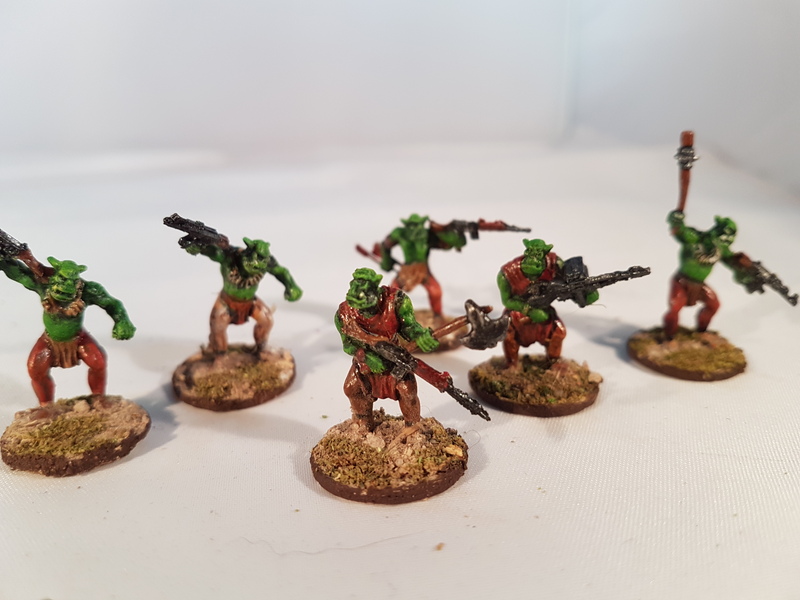 Their numbers are vast and they have a firm mastery the arts of wizardry – a Grand Army of the Ancient Regime is a fearful sight to behold, their vast columns of swordsmen, cavalry, riflemen, armour and their elite wizardy cadre represent a powerful force, but their empire is stagnating. Rituals, feudalism and a distrust of technological research has stifled new thinking and innovation. 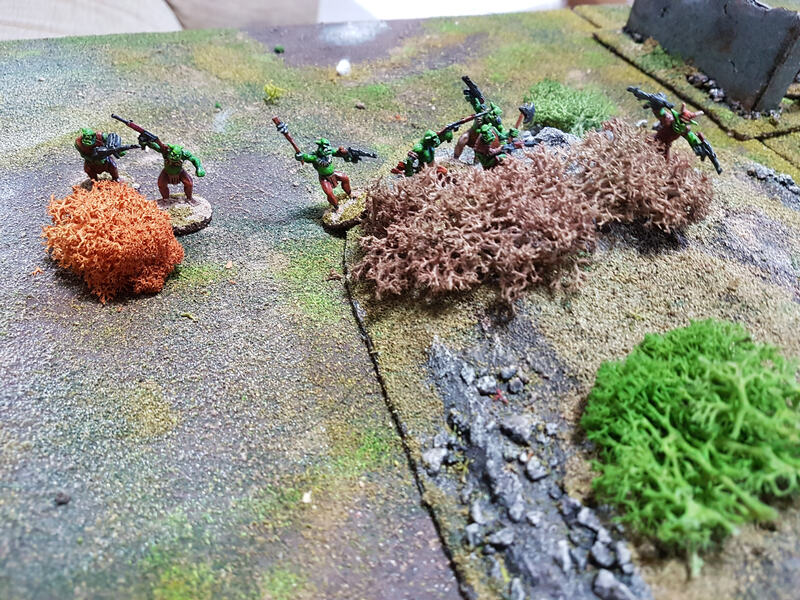 So, our first playtest battle used the Ancien Regime and Grand Alliance armies detailed last month – no points values at this stage, and the objective was control of the central rocky gulch. Great fun was had, and I’m stunned how closely matched the forces were considering list balance was largely guesswork! Both sides faced off with objective in central gully – superheavies (the Ironclad and the Dauntless) deployed to use cover, with the Grand Alliance planning to whittle down and counterattack their far more numerous opponents, while the Ancien Regime forces detailed their two Grenadier squadrons to take objective, while the massed musketeer regiment would cover the more open left flank pinning down any opposition, whilst finally the Cuirassier cavalry and A7V light tank would sweep around right and crash into Allied lines. 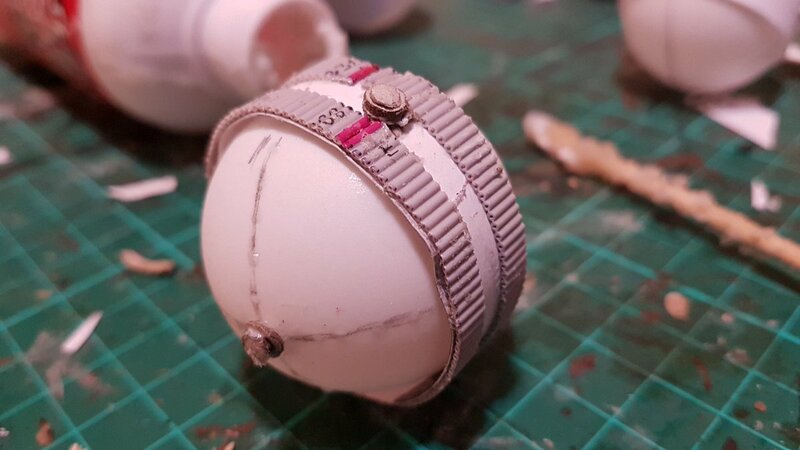 The Dauntless shook off lightning storm and recovered to hide and ambush Ironclad, washing it in Vrilfire and denuding it off its port side Maxims, eventually immobilising it and then destroying it completely at the cost of her missiles and a damaged engine. 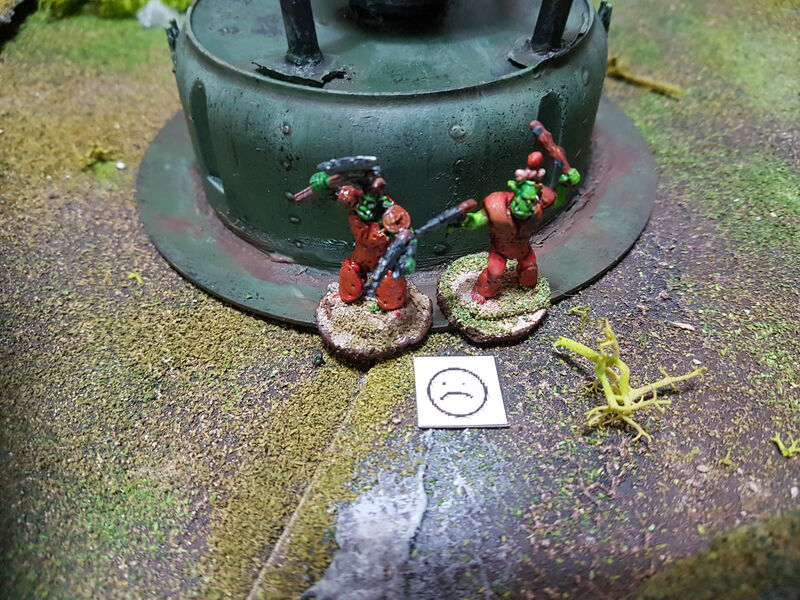 Meanwhile, rifle and mortar fire raked the Grenadiers, whose A squadron charged the Sky Marine command group and wiped them out. 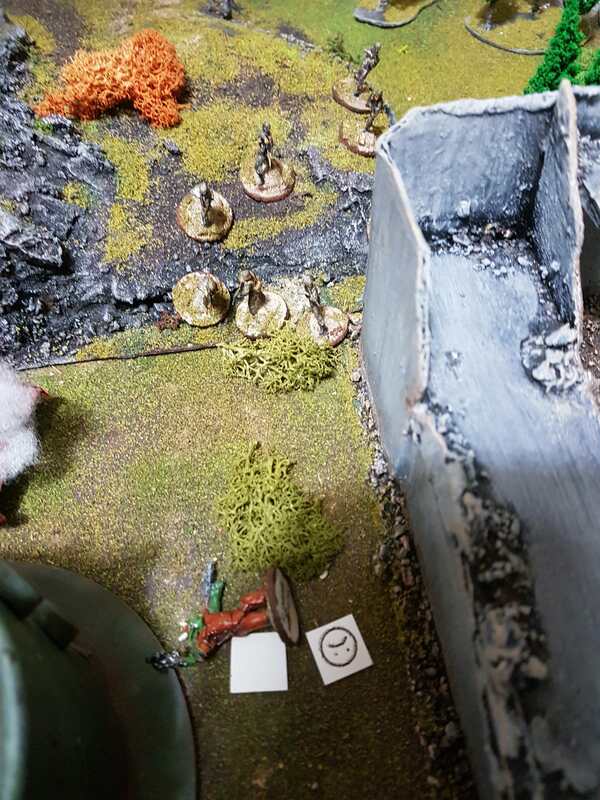 In their turn, these men were blown apart with grenades and B squadron fell to one survivor. 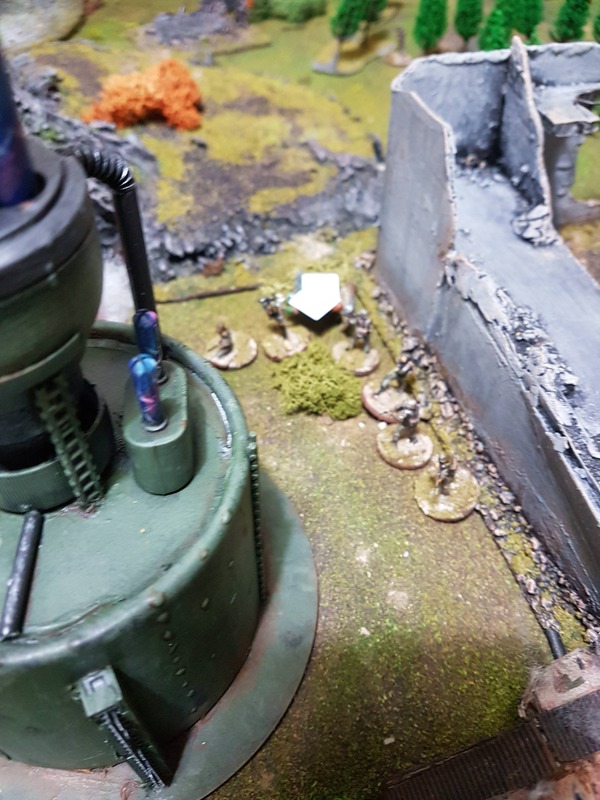 In an astonishing move, this heroic Grenadier charged the remainder of No.2 squad who promptly surrendered and became POWs! The shame! Meanwhile the Dauntless crew finally hunted down incinerated the sorcerer who had caused them such misery. As she closed on the Musketeers, No. 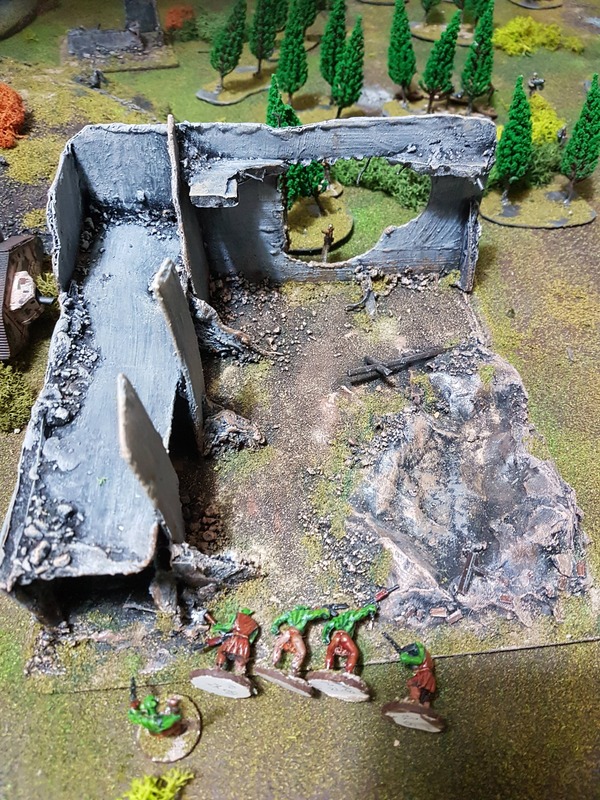 1 squad charged to rescue their pals, and the Musketeer colonel turned to see a listing, smoking Dauntless hovering over his men, cannon and Vrilfire thrower at point blank range. Realising there was nothing to be gained by sacrificing his men to a horrific agonising death, the colonel raised his hands in surrender, bade his men do the same and led the survivors into captivity.. 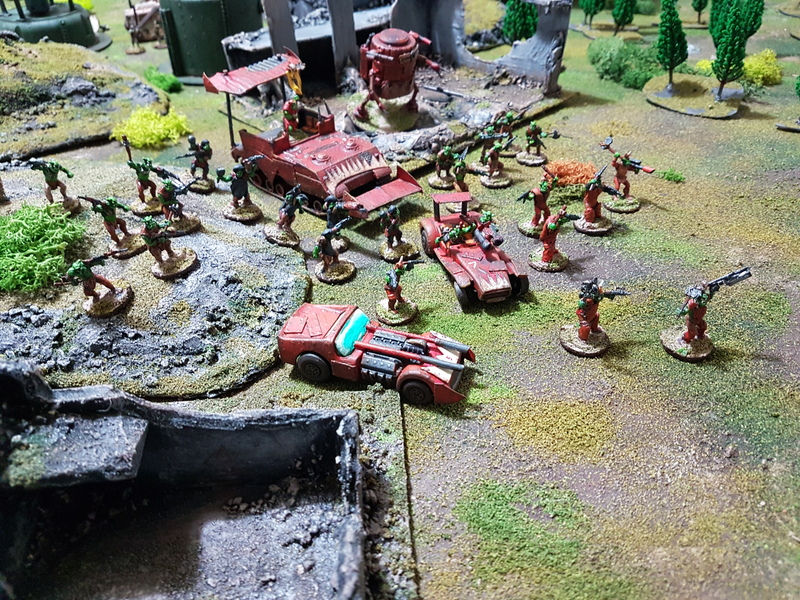 Deployment – Grand Alliance Sky Marines in the foreground, serried ranks of the Ancien Regime in the background..
Battle is joined! The mighty Ironclad anchors the centre while the cavalry make use of cover..
Wonky camera angle, sorry! 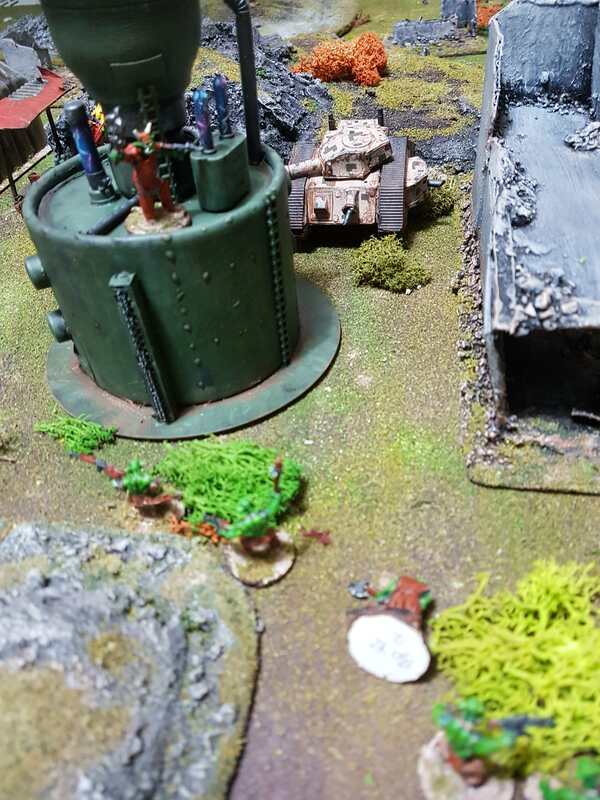 Cuirassiers crash into the Sky Marine lines..
Grenadiers assault the objective – Sky Marines are struggling at this point against sheer weight of numbers..
Grenadiers charge and wipe out Sky Marine HQ! 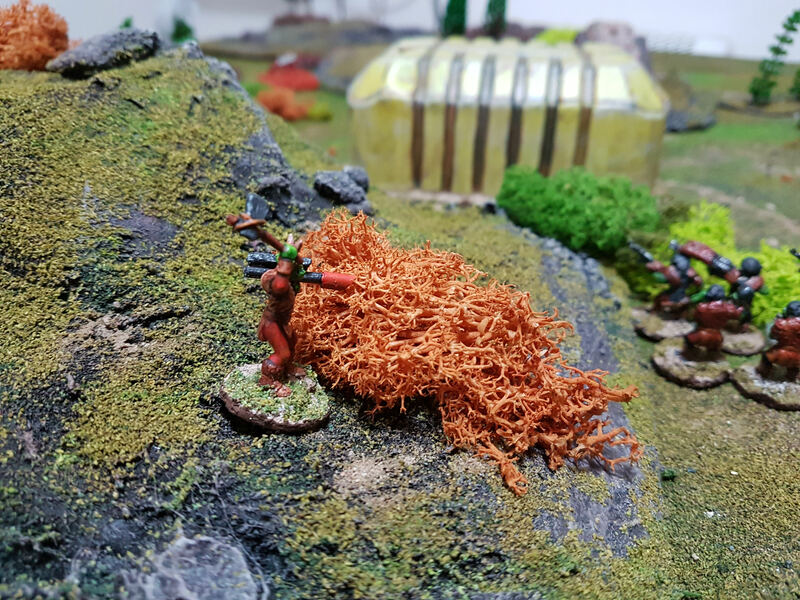 Result – Grand Alliance victory, by a hair’s breadth! Altogether, awesome game! A few pointers which we’ll take into the next playtest (more varied spells, pin down exactly how power fields regenerate etc) but overall a resounding success. 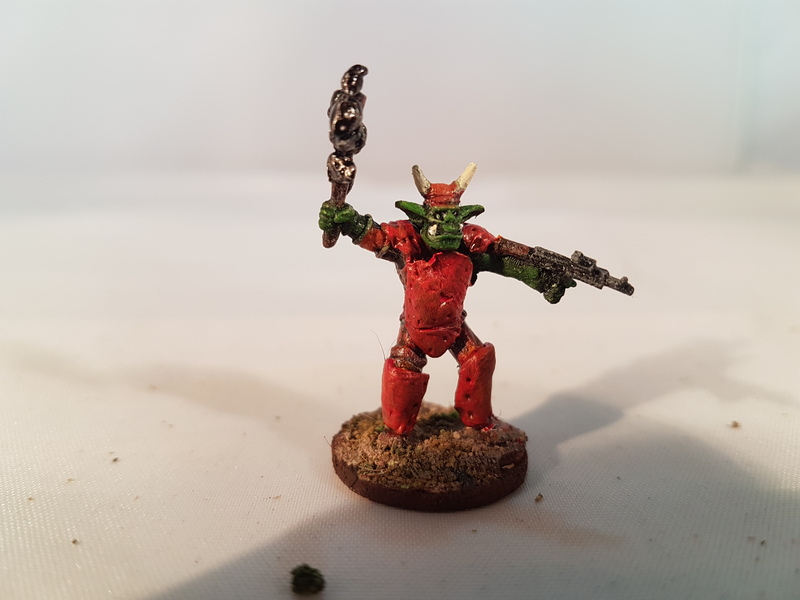 Props to Dan for being an always challenging and sportsmanlike opponent, and stay tuned for more Hyperian Wars! 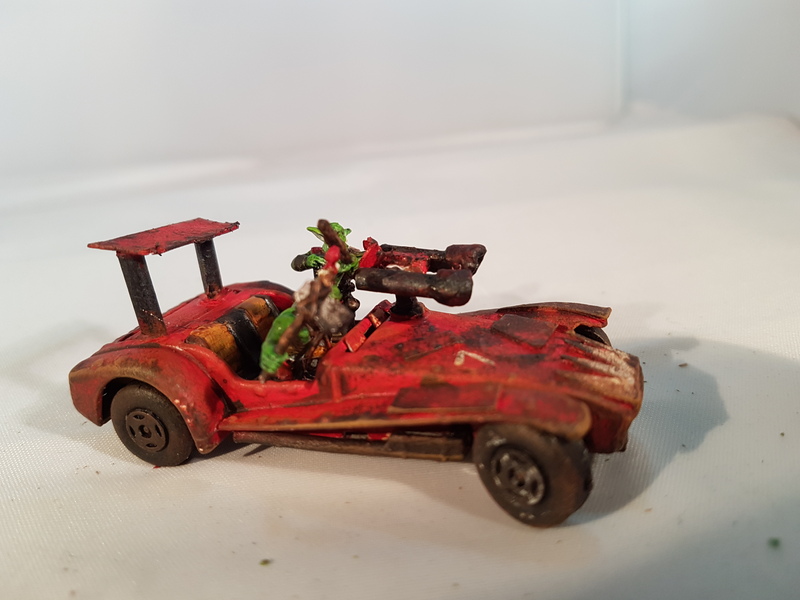 Mega Summer Update -1/72 Wackiness! Crikey, I blinked and I almost missed August! 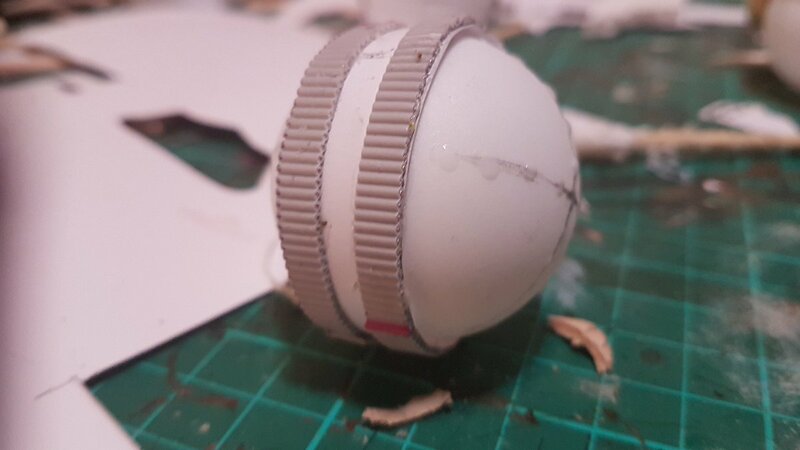 Well, we’ve been busy down here at Skinflint HQ, with a variety of different projects – so apologies, this might not be the most focused of posts, but there’ll be plenty of 1/72 weirdness to enjoy.. This is a tele-logistics hub for the Atlantic Alliance logistics corps – in the fluff, alien tech captured at Roswell in 1947 led to the Philadelphia Experiment a few years later, which failed in its original purpose but the side effects led to Alliance scientists mastering teleportation. However, seeing as the setting is the mid-1950s, we did’t want Star Trek-style transporters as that wouldn’t fit the story.. how could the world fall into an endless apocalyptic Second Great War if all Churchill or Eisenhower had to do was beam a bomb into the centre of the Kremlin? So there are limits. A teleporter can’t transport live organic matter as the computers of the day don’t have the power to reassemble it, so it’s strictly limited to supplies. And you can’t just beam anything anywhere, there has to be a homing beacon set up – these beacons are known as hubs, and they are an essential part of the Allied war effort, far less vulnerable than conventional naval convoys. 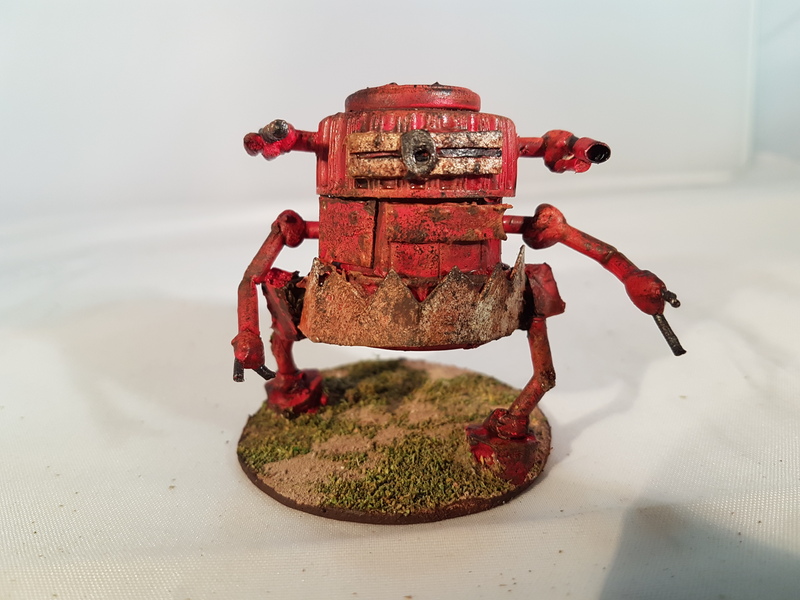 So this little puppy is built from a variety of household junk – beginning with a CD spindle, and adding various bits of miscellania – the hoses you see are used guitar string cut offs -given a black undercoat, drybrushed with metallic paint and then details picked out and highlighted. 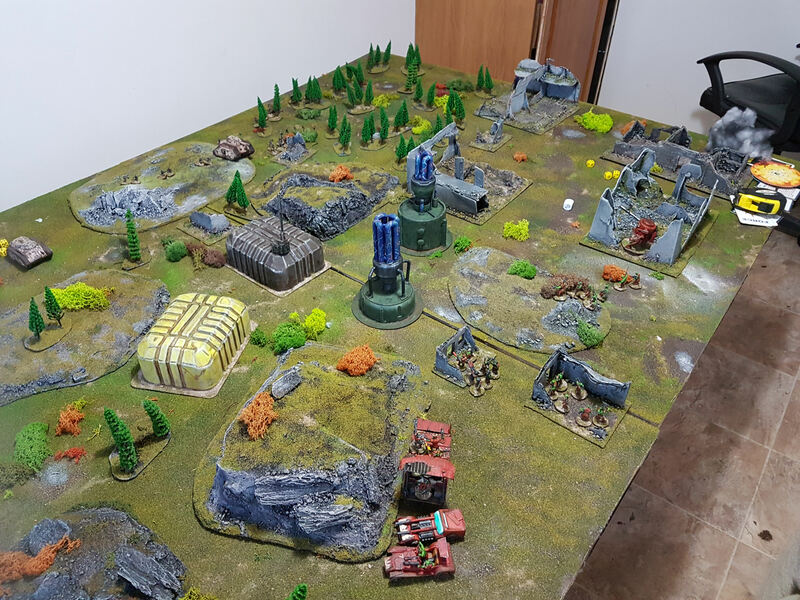 It made a great objective in our last game! 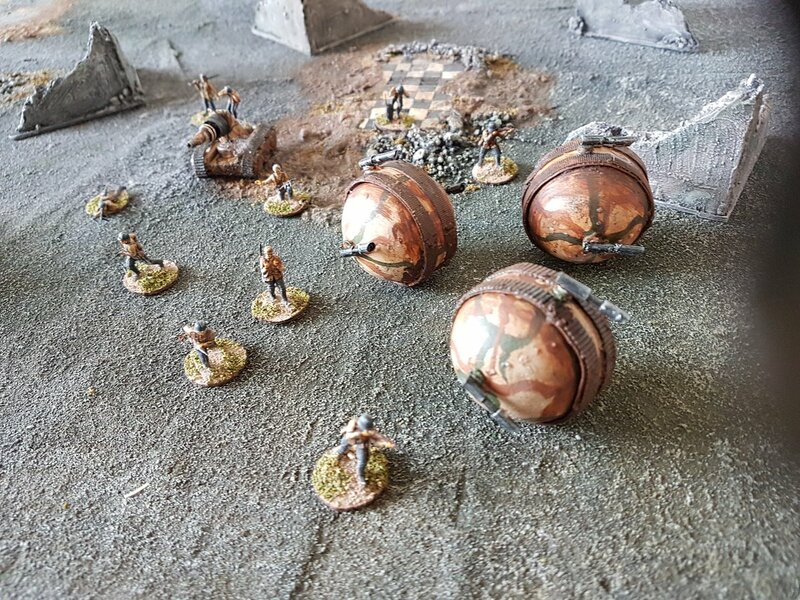 Next up – Steampunk Fantasy WW1! 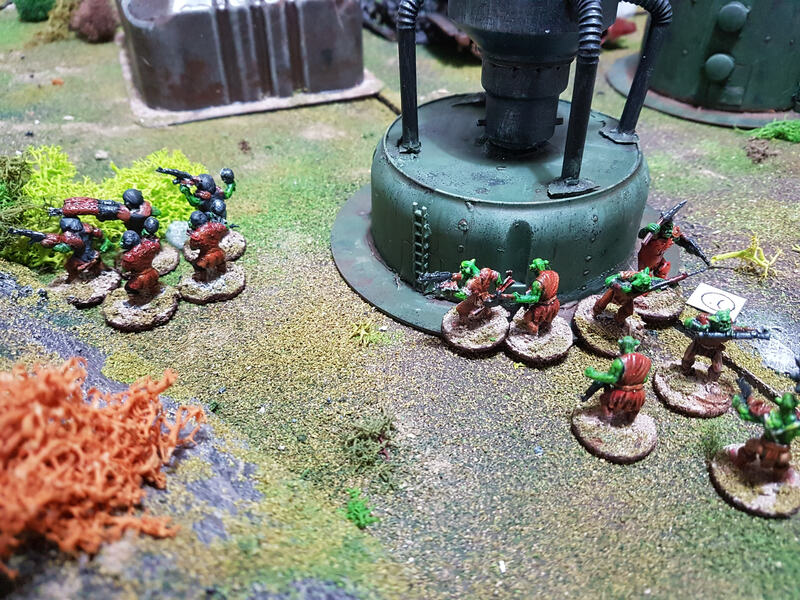 These are Airfix WW1 British infantry, to double as Grand Alliance Sky Marines for our steampunk/fantasy A:E adaptation, “Hyperian Wars”. 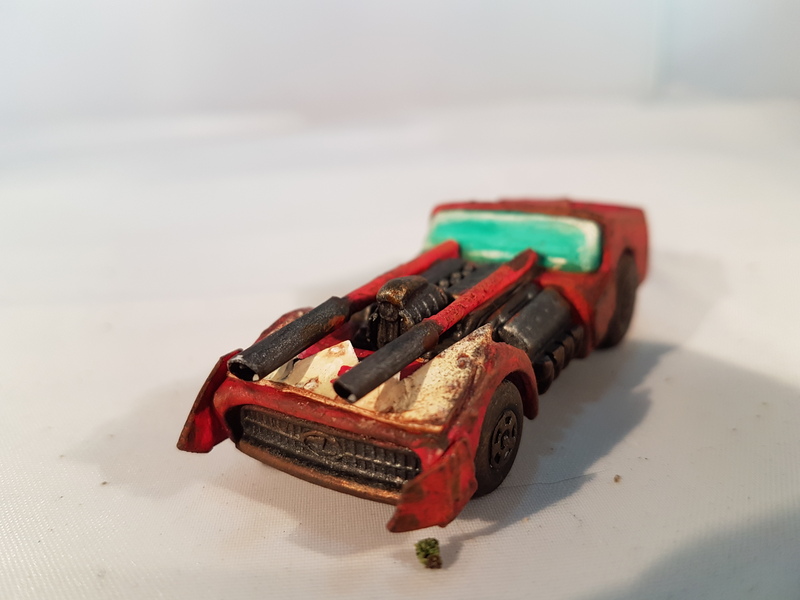 They were part of an Ebay haul from a few years back. CO – moustache and sabre firmly in place! 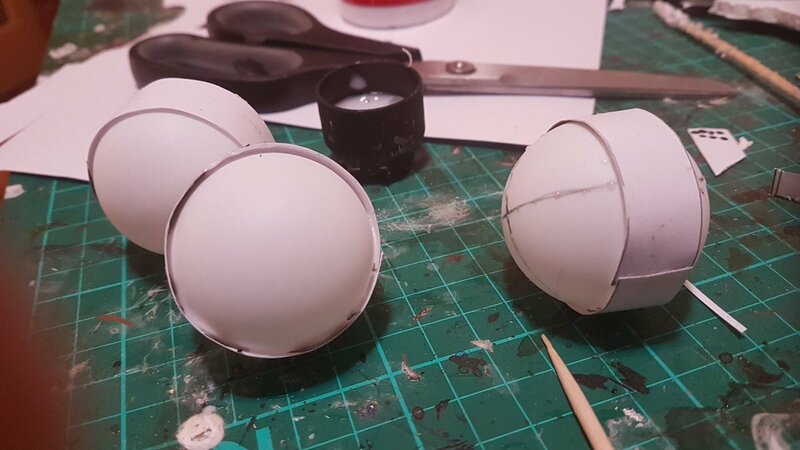 Continue reading Mega Summer Update -1/72 Wackiness! Following the Roswell UFO crash of 1947, ARPA worked feverishly to engineer new technologies based on their discoveries.Not all their experiments would prove successful, however, and the 1949 Philadelphia Experiment – originally conceived as a means to “cloak” a ship – was a horrific failure. An offshoot of the program carried on developing the principles of teleportation that had been inadvertently discovered, and although a couple of early catastrophic failures in testing proved that organic living tissue could not use these machines, they were fine for inanimate objects and machines. At a stroke, the Atlantic Alliance’s logistics corps was revolutionised, and each theatre of the Apocalypse War is equipped with tele-logistics nodes such as this one in the town of Kessenburg, central Germany. 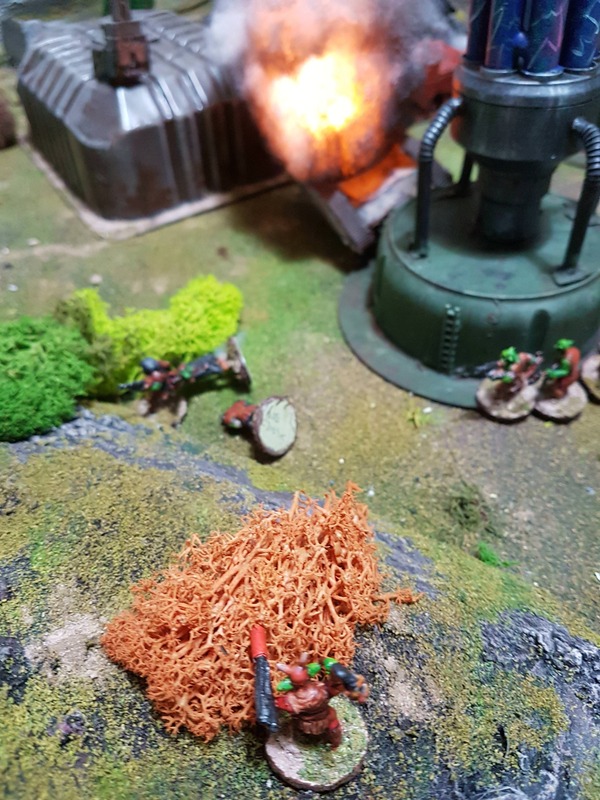 The original installation fell victim to an artillery and psychic bombardment from Holy Soviet Empire forces on a sector wide offensive, and Allied X Corps Command ordered a rescue detachment to the area to prevent the Soviets capturing the node and it’s advanced technology. Victory conditions – to control the node, the player must have unsuppressed troops within 5cm of the outer edge and no unsuppressed enemy forces within the same distance.Your objective is to control the node for three uninterrupted turns allowing the auto evacuation mechanism time to lock on to the nearest homing signal and teleport to safety. 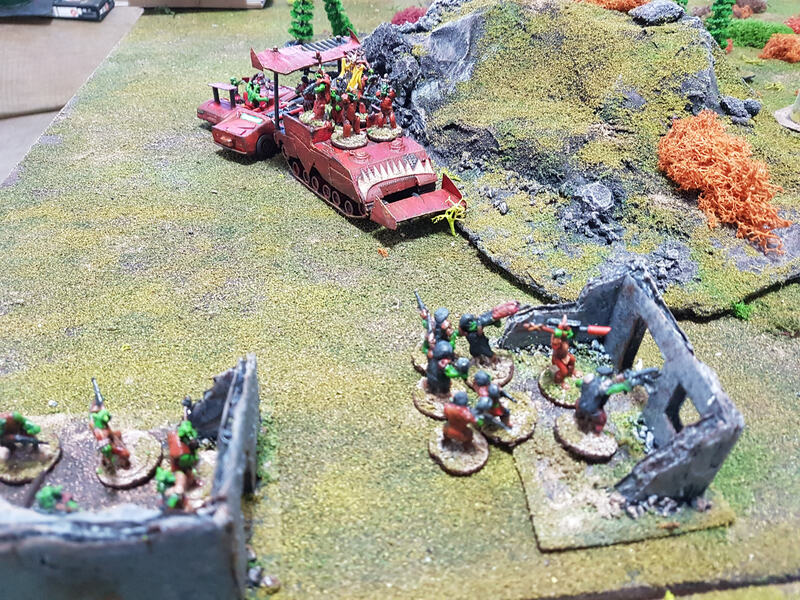 So, following the trip to Warhammer World last week, I was raring to go and get a game in, and on Sunday evening Dan rolled up with a crate of Carling in one hand and his Holy Soviet Army in the other – game on! 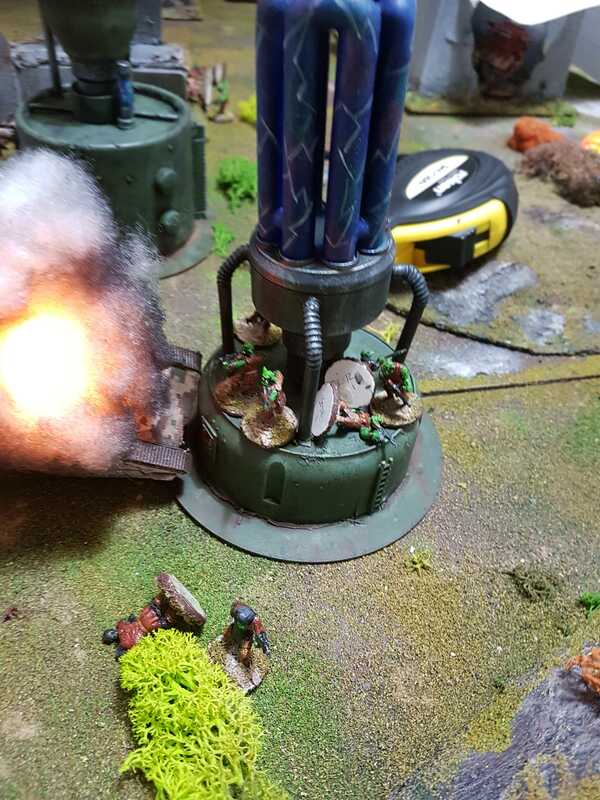 I had a few new toys to try out, so we cranked up the fire support allowance for Dan, and we both tried out the new Command Cards idea – basically, to make your CO and XO extra valuable, they can force extra actions, prioritise fire support, benefit morale etc. As it turned out, neither that or Fortunes Of War had any impact on things but it was a great game nonetheless! 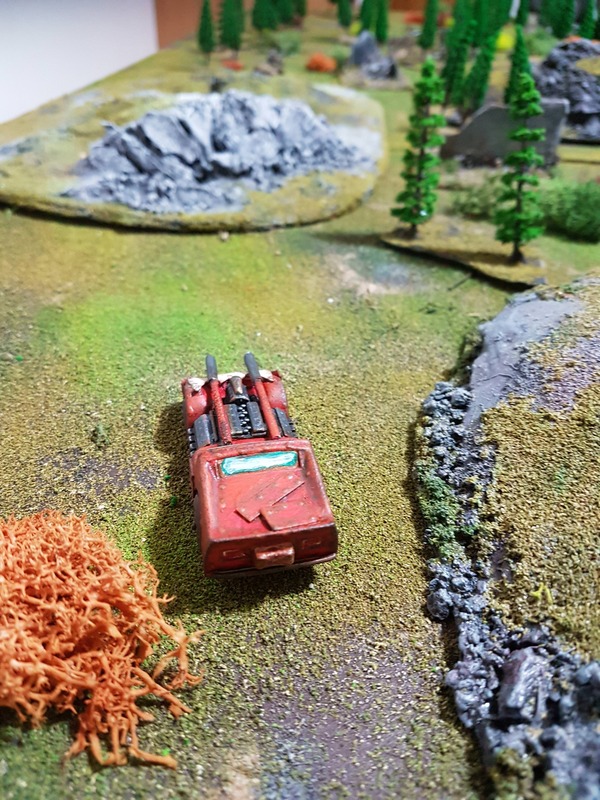 Swanky new APCs make their debut, with M85 combat ‘bots in support – my infantry were deployed in the APCs, going for a “cavalry” feel today! Dan’s Holy Mystic and bodyguard – I was determined to terminate with extreme prejudice after his telekinetic tank-lobbing exploits of late.. 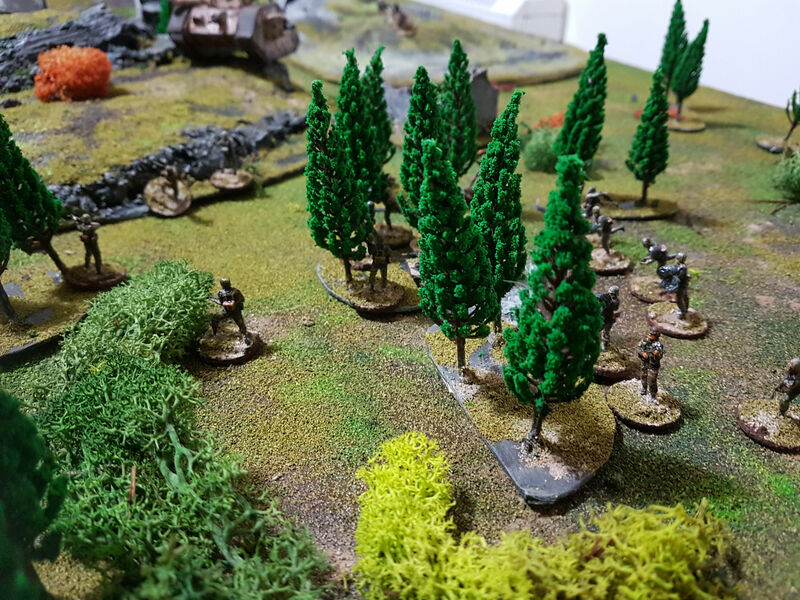 The game started with both sides jostling for position and few shots being fired. 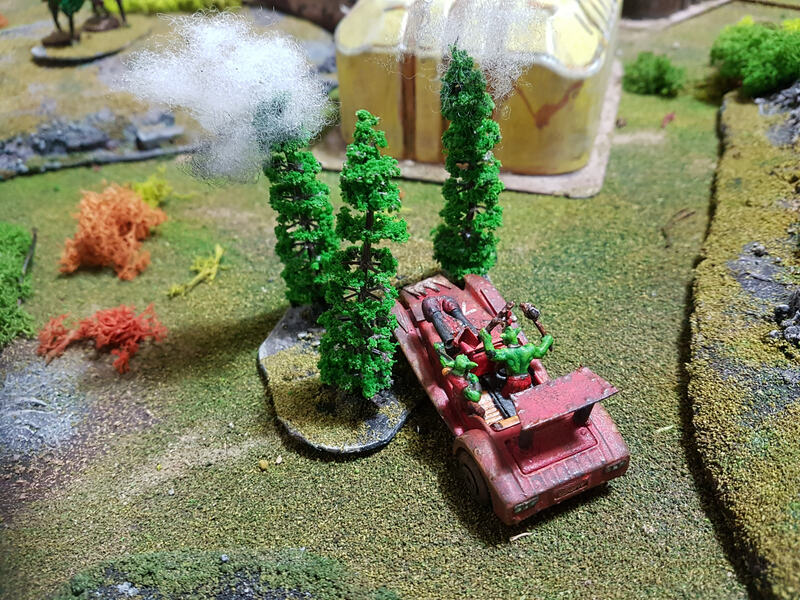 My infantry deployed straight from their APCs onto the objective, securing it in Turn 1 – I noticed Dan hadn’t put his assault troops in the Soviet APC, as last two games, it’s been hit before it could be activated and his badass Siberian psychopaths have been barbecued.. 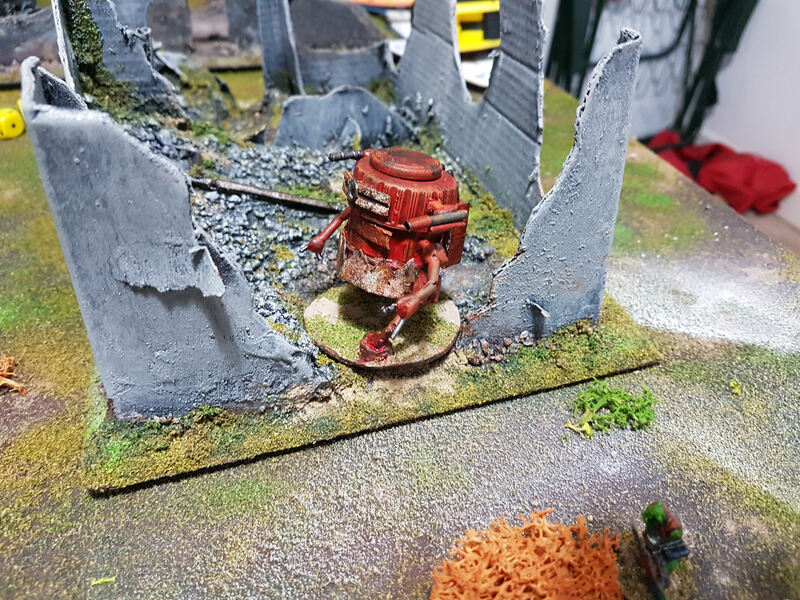 Turn 1 – Fireteam Charlie 1 take down said scary Rampager with a Stinger/TOW! They never normally hit ANYTHING until Turn 3! 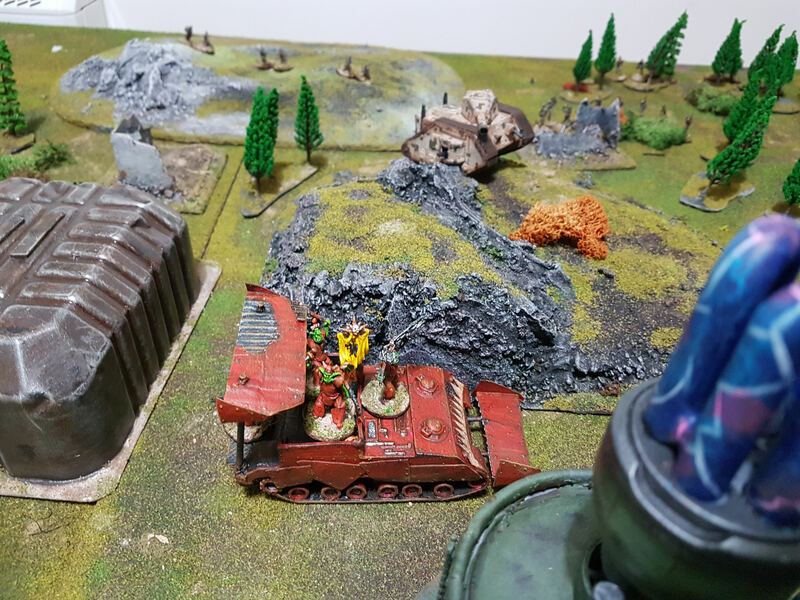 Turn 2 – The Soviet Beastmen hop out of their APC and slaughter Delta squad! 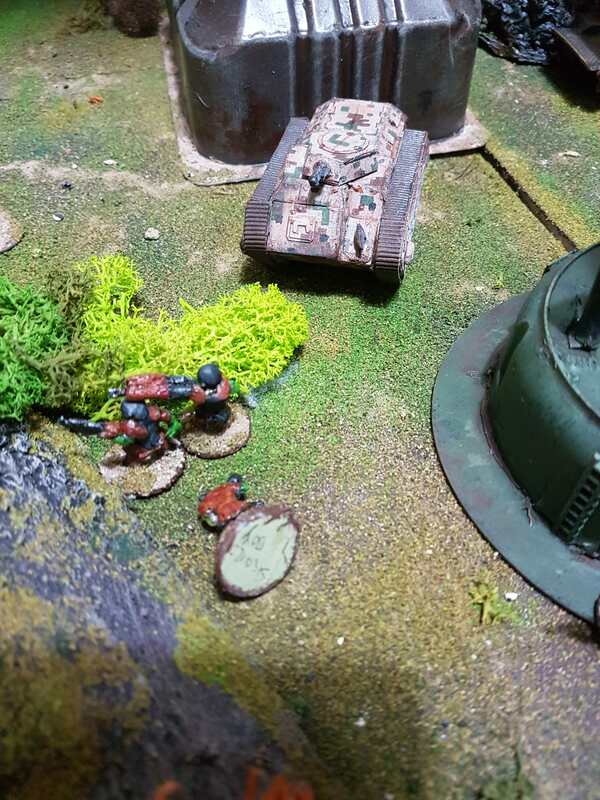 Turn 2 was where it all hit the fan, the Soviet assault got its momentum and my right flank was a mass of blazing armour! 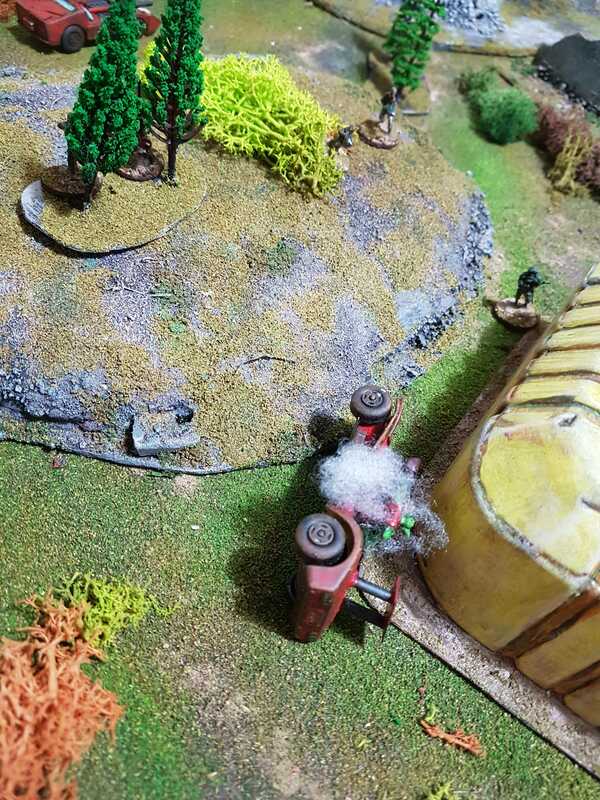 However a lucky shot from a machinegunner had taken down the Soviet RTO which meant no fire support calls – lucky for me, as I was losing infantry hand over fist.. and I didn’t have many to begin with! 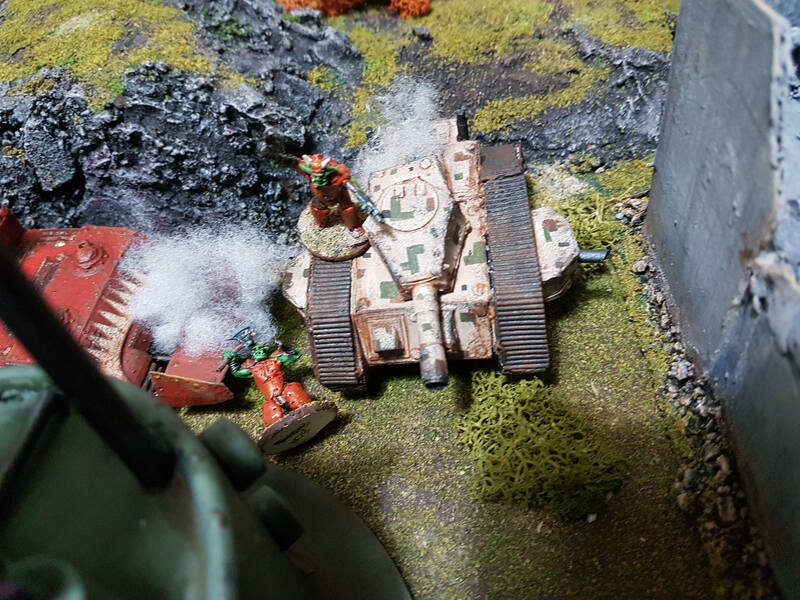 Unfortunately (depending on your point of view) they couldn’t quite carry the momentum – the Beastmen slaughtered Delta Squad but were blown to pieces by the heavy machineguns and cannon on the APCs. 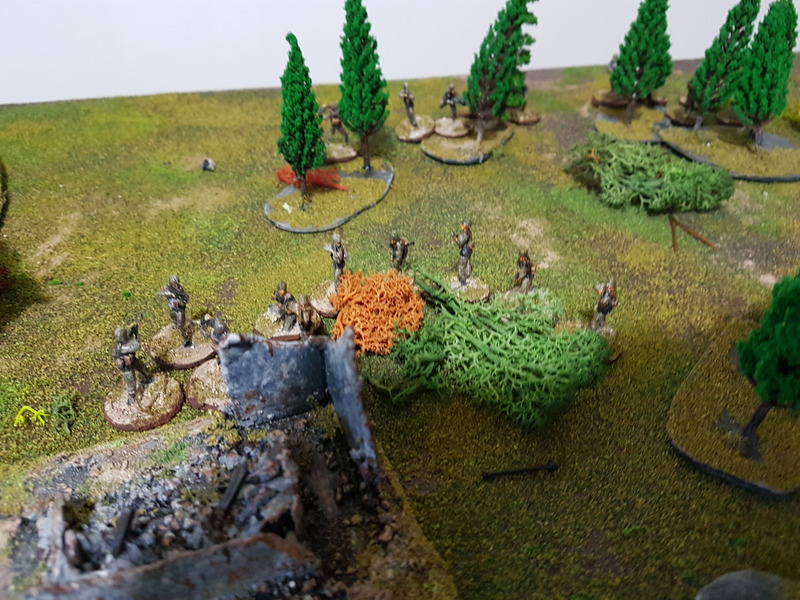 Turn 3 – His HQ wiped out, Polikarpov leads the remainder of his platoon in a furious vodka-induced charge, challenging my remaining Command Element member to single combat..
..and winning! 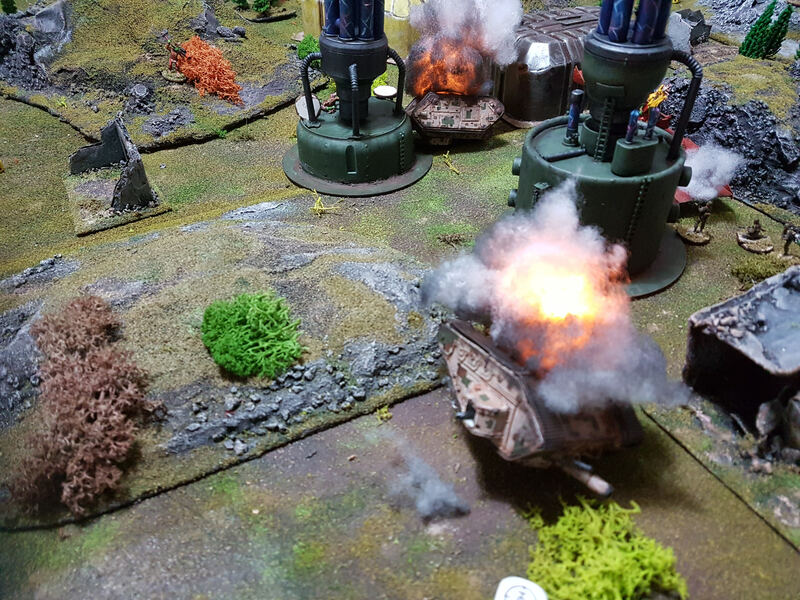 Platoon Sgt’ McAuliffe’s credentials as a hardass are somewhat dented..
Smashed and burning armour litters the table – a good game! So there we have it – Alliance victory, although only just, I literally had about three infantry left, plus the ‘bots and one operational APC. 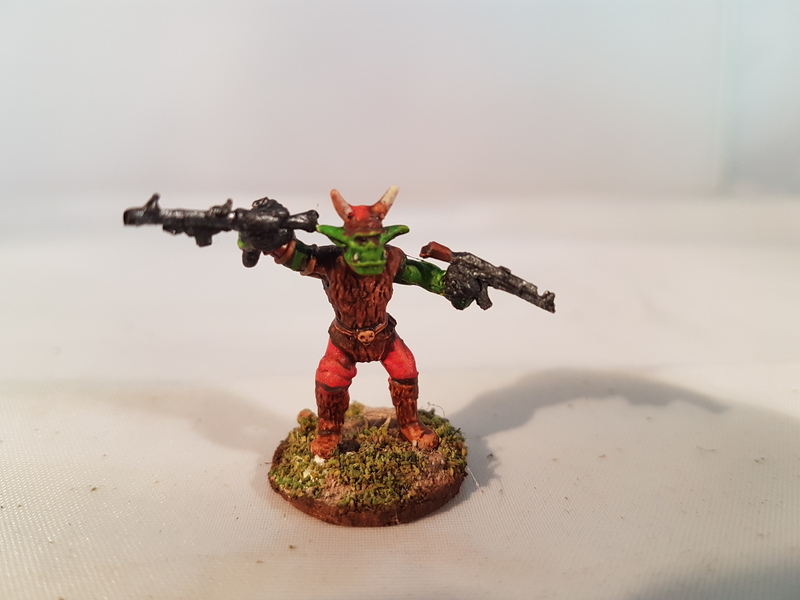 Had Dan been able to successfully call fire support, we’d have had it. Damn it was fun though! And the Charge of Lt. Polikarpov – Dan, you paint a medal on that guy! 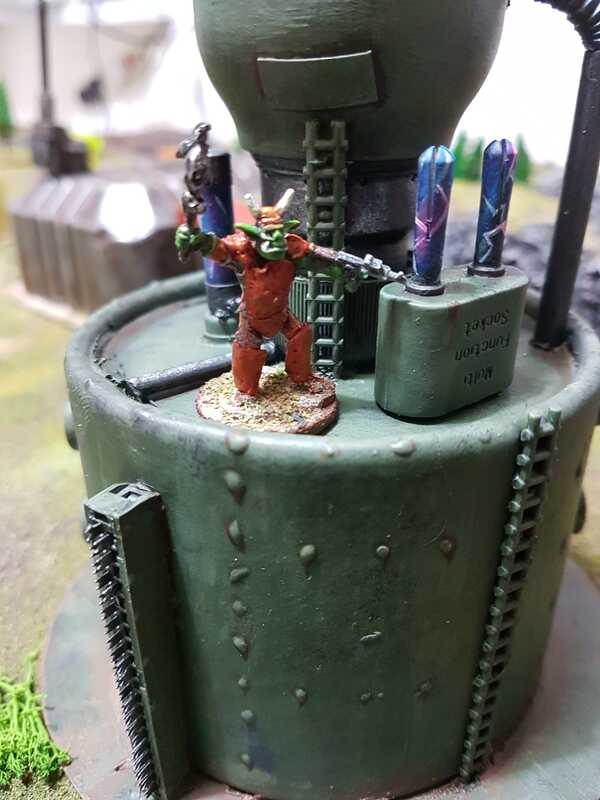 A couple of thoughts – the Tesla troopers actually got some licks in and fried a pair of tanks, but my Dreadnaughts couldn’t do a damn thing – I think we’ll up the minigun penetration just a touch so they at least have a slim chance. 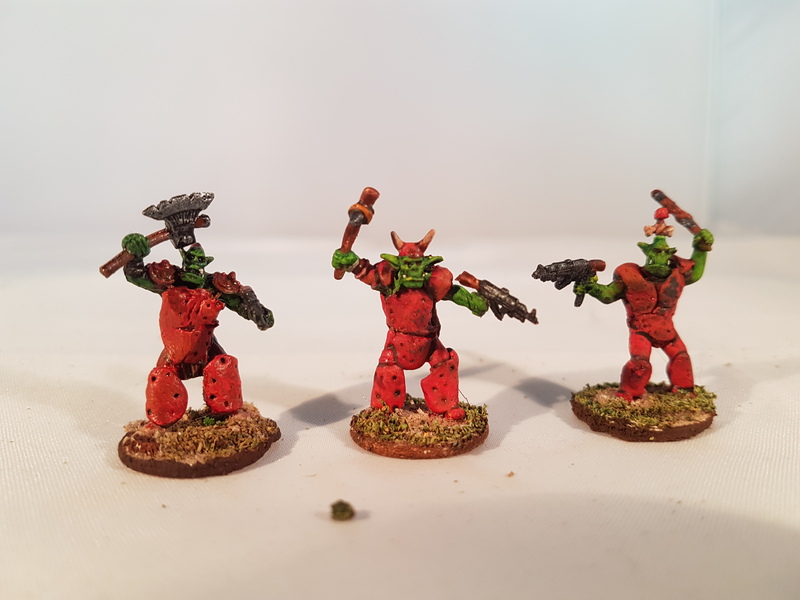 The BEastmen need to be tougher too, I suggest scrap the 6+ save and go for an armour rating maybe 9, plus some kind of resurrection rule – fits the fluff better. 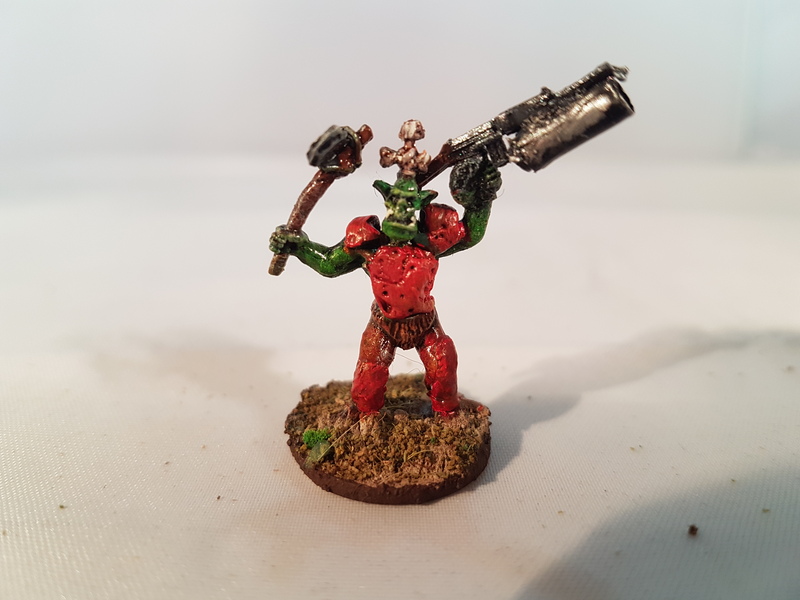 Anyway, more new toys to come, plus our fantasy setting – “Hyperian Wars” – stay tuned! 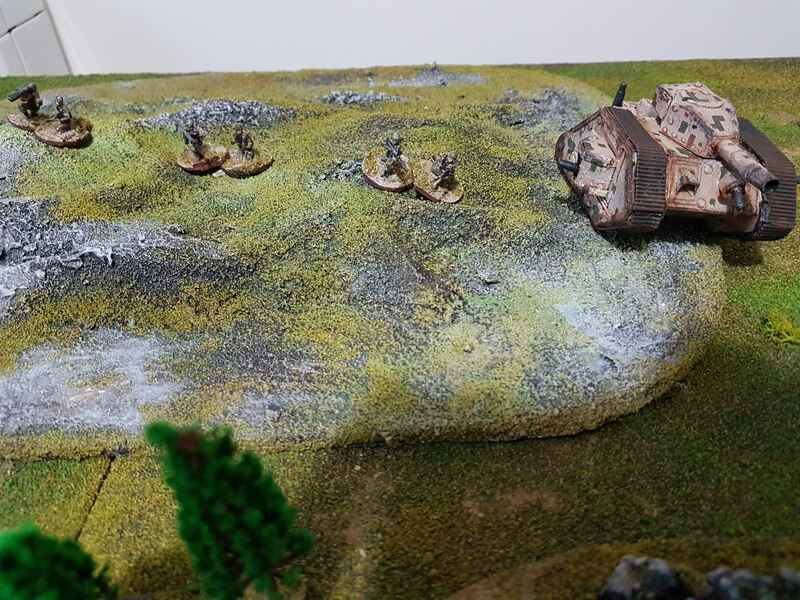 Here come the (Armoured) Cavalry! 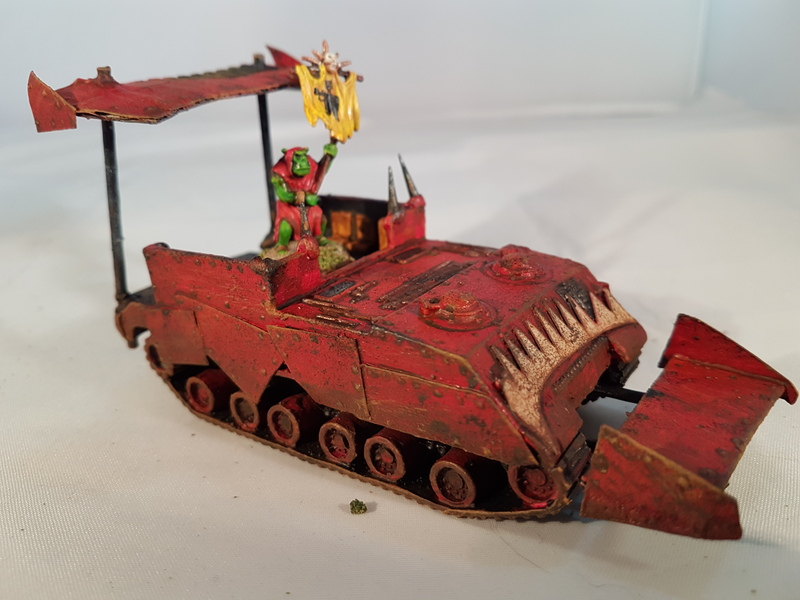 A bit of Google Fu later (papercraftsquare.com) and I had me a rather nice M113 papercraft template which I printed out straight onto cardstock. 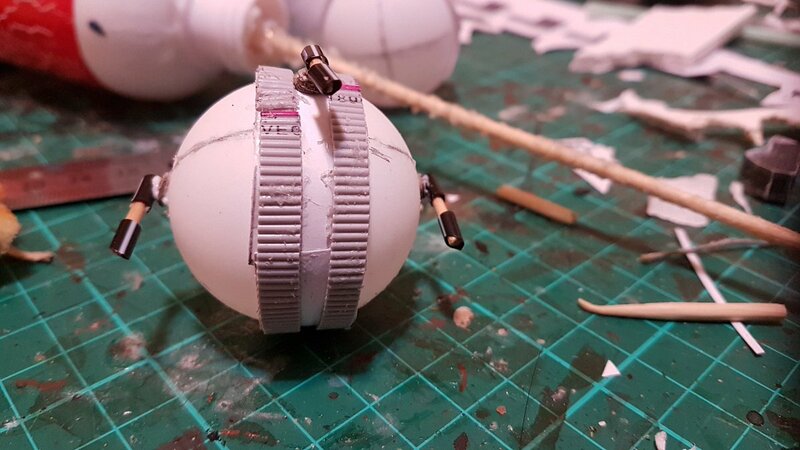 Now, I did botch the first one a bit – leading to a low slung “sports APC” look, but the addition of spacers covered by some armoured skirts seemed to do the trick, and had the bonus of giving it a more “sci-fi” look. 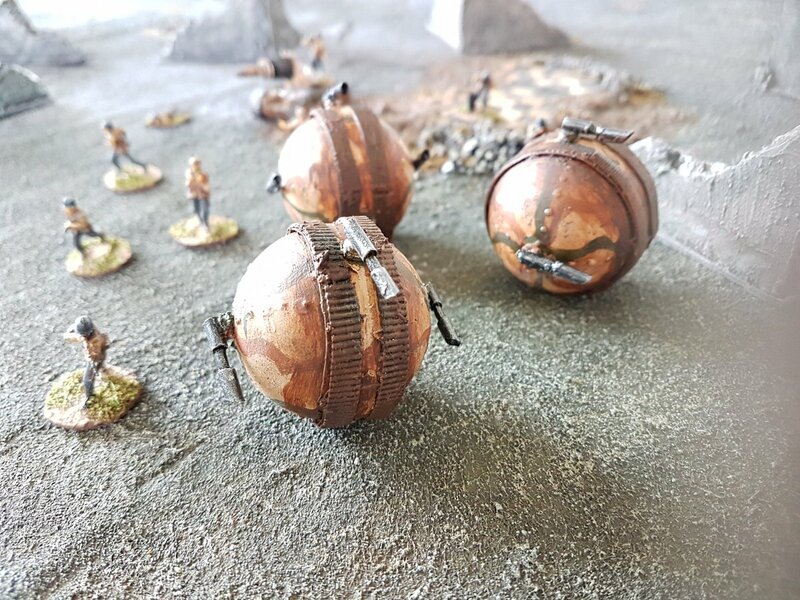 From left to right – mounting Mk 19 grenade launcher, M2 .50 calibre heavy machine gun and 20mm autocannon – lots of yummy firepower to back up the dismounts! 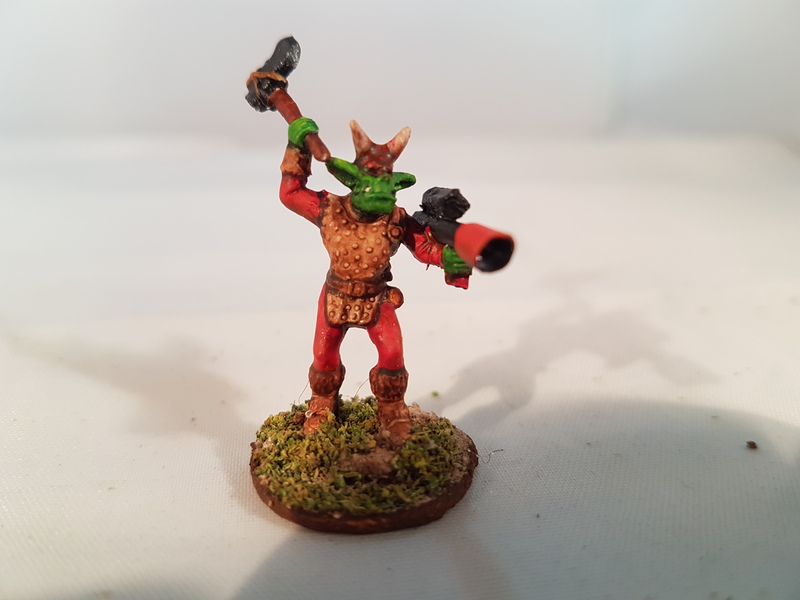 Some of you might notice a bit of a change in painting style – I’d gone for a heavily weathered BAOR type look previously, but after checking out this guy’s blog I just had to try my hand at some digital camo! It’s based on the 1970s DualTex scheme, and it’s just the kind of thing I can imagine UNIVAC coming up with – a kind of primitive-retro sci-fi idea, perfect for Apocalypse: Earth! Looking forward to getting these guys on the tabletop and deploying Buffalo 2-7 as an armoured cavalry force! 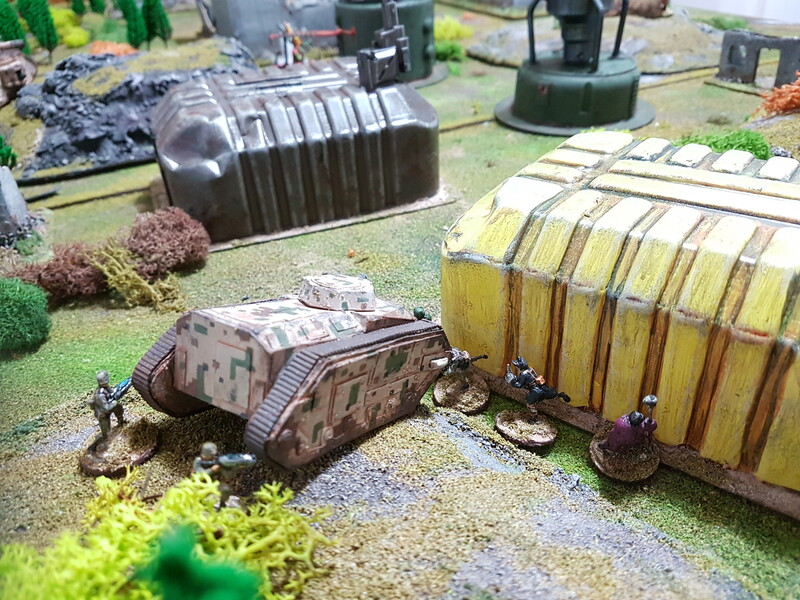 So we rolled out with everything a couple of weeks back, testing out the new Rampager, Elektra, Inferna and Siberian units on the Holy Soviet Empire side, and letting the Atlantic Alliance give their M85 Autonomous Combat Platforms and M60A3 Centurion squadron a maiden airing. 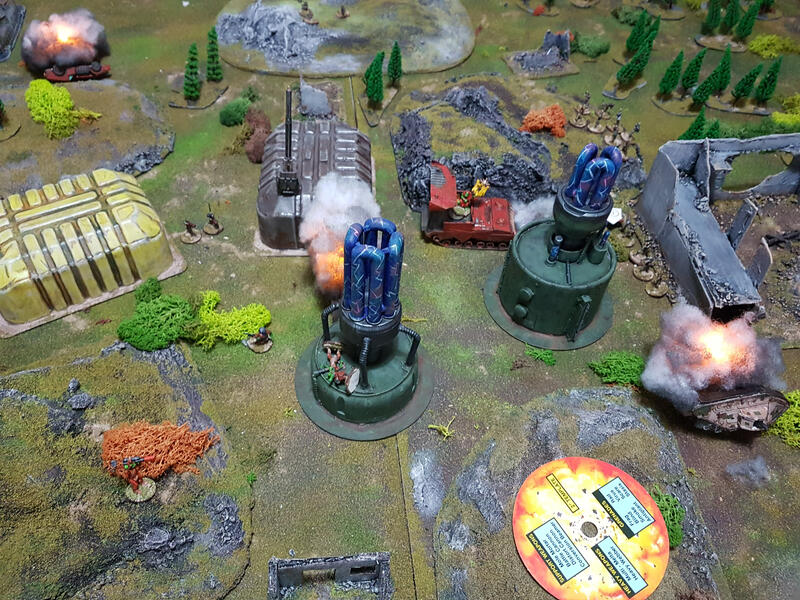 The full after action report will be published in our new (free, digital, available for download here and Wargames Vault)) magazine just as soon as we can get it all written up, photographed and DTP’d, but meantime there are a few fine tuning details we can take away from what was a hard fought, close run and hugely fun game! 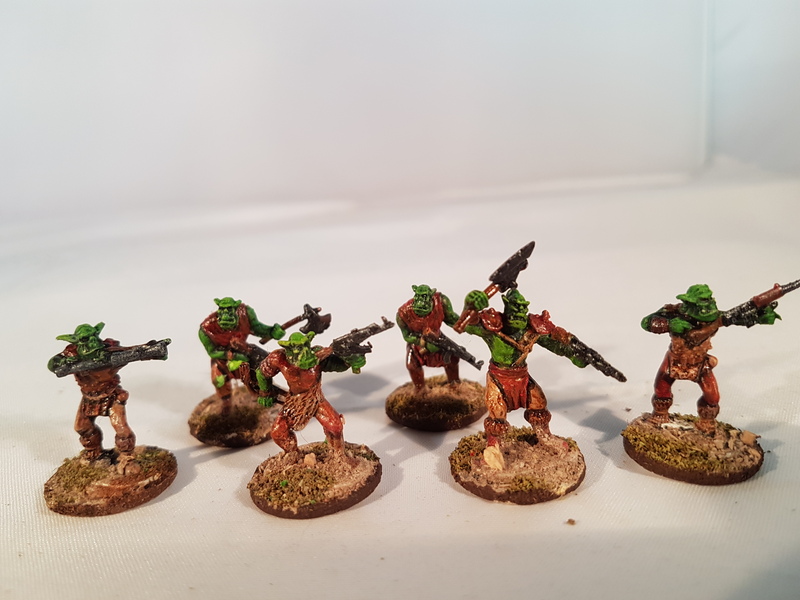 Dan, your snipers are way too expensive.L’il ol’ Vasily accomplished precisely squat despite being twice the cost of a rifle squad! Yes he’s hard to hit, but what’s the point of he just sits there? I suggest we halve his points cost and give him an “Infiltrate” skill to ensure he can deploy somewhere he can get shooting straight away. For fairness, we should give my Ghost 7 team the same skill, of course! 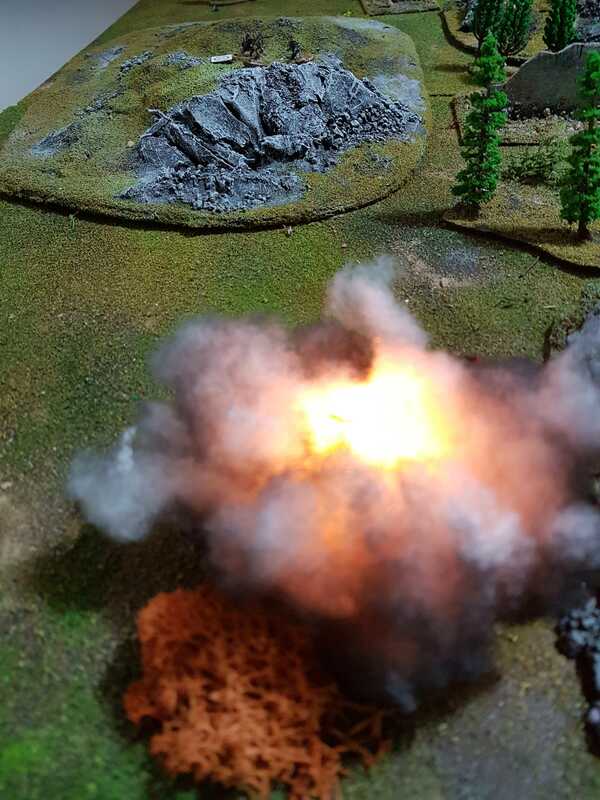 Spotting for indirect fire – let’s clear this up. For off table support, I think we can let that be targeted anywhere (“Sir, Zaplinsky reports enemy tanks on the ridgeline!”) but for on-table indirect fire such as mortars,someone in the squad needs to be able to see the target (“Rogers, shift your fire, 10 meters bearing five two!”). 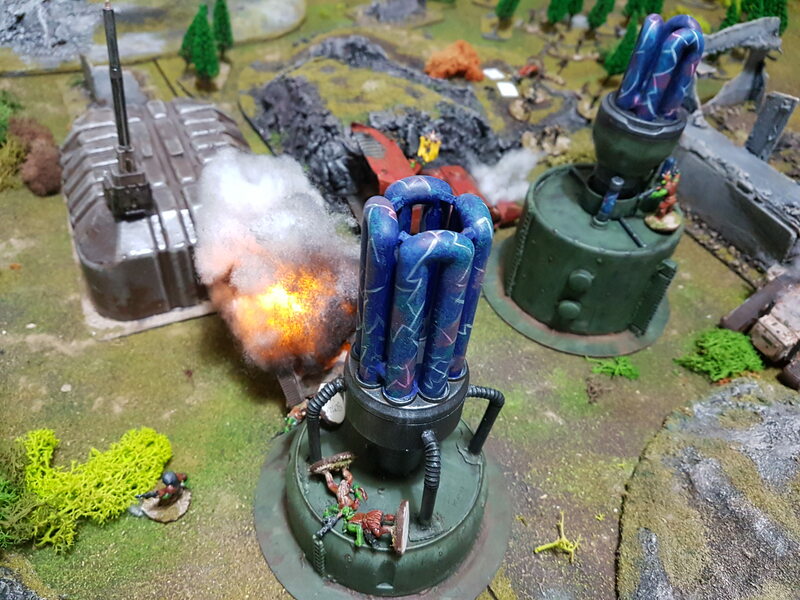 Although it pains me to say it after what happened to my HQ, “speculative fire” actually does make sense – “Drop a few rounds behind those bunkers, Corporal, lets flush out anything that might be hiding” – so after much soul searching I’m turned around on this one. 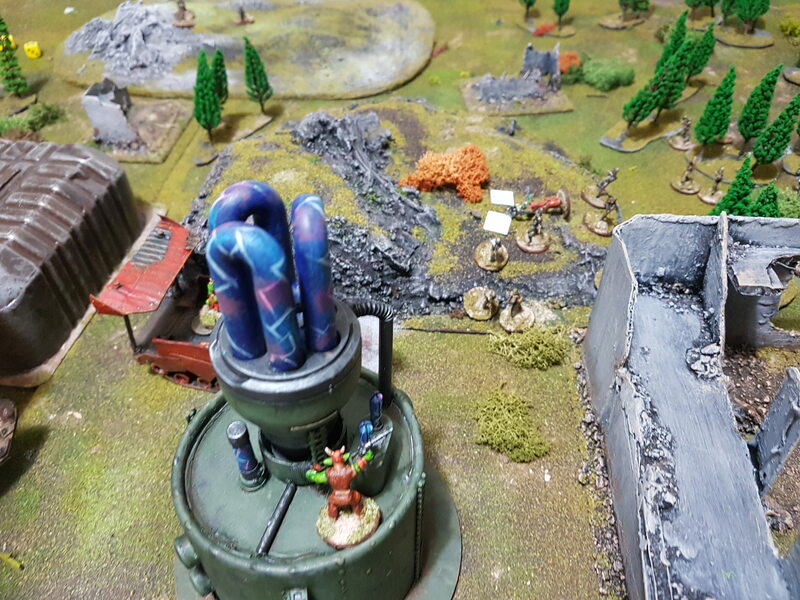 Objectives – For all the fun, the game still turned into a bit of a kill-point-slug-fest by the end. I suggest making each objective 45 vps rather than 40. 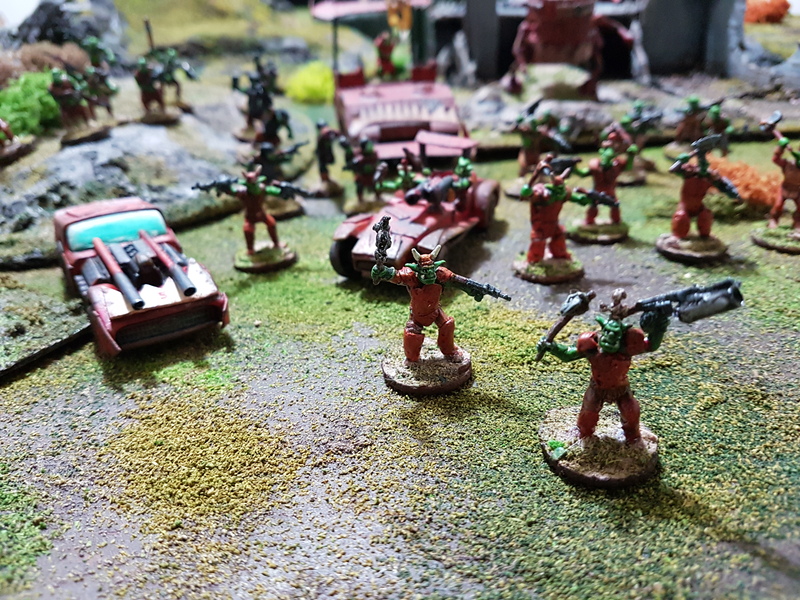 It still means a bit of a scuffle in smaller games (you can’t win a 500pt match without some shots being fired) but it does encourage more manueuvre. 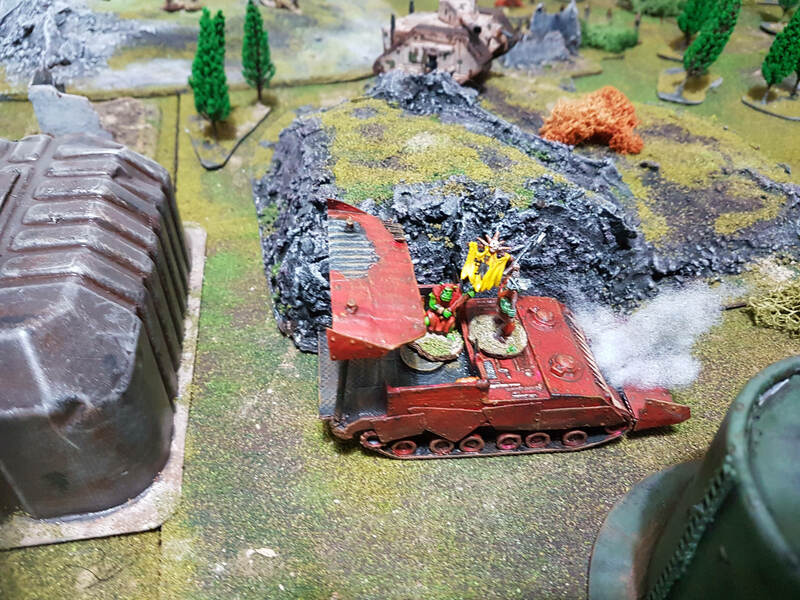 As we saw, you can’t really capture all 4 objectives in a 2000pt game anyway unless the other guy collapses so there’ll still be plenty of carnage! This is actually a positive but I loved the way the tank fights played out! 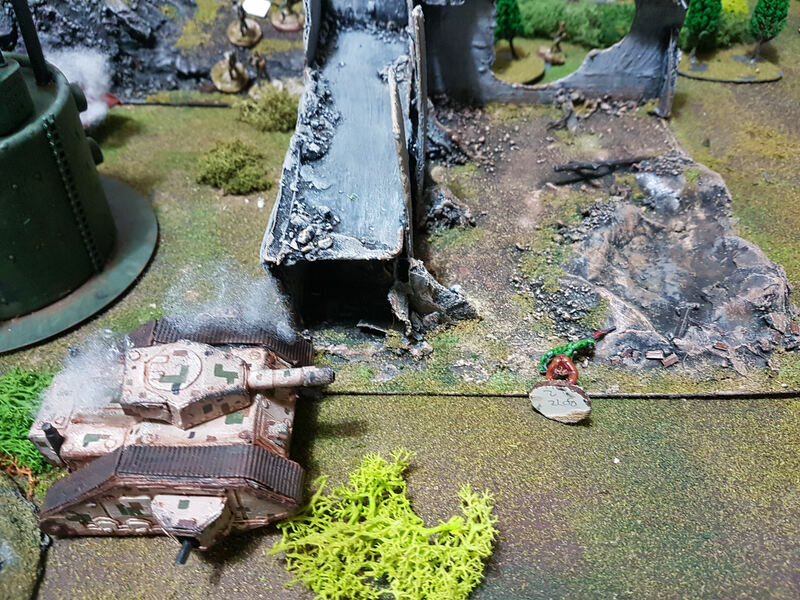 LOTS of maneuvering to get a better shot through weaker armour, the open spaces on the table east edge were a whirling knife fight between my M60s and Dan’s T-48 and Rampager! 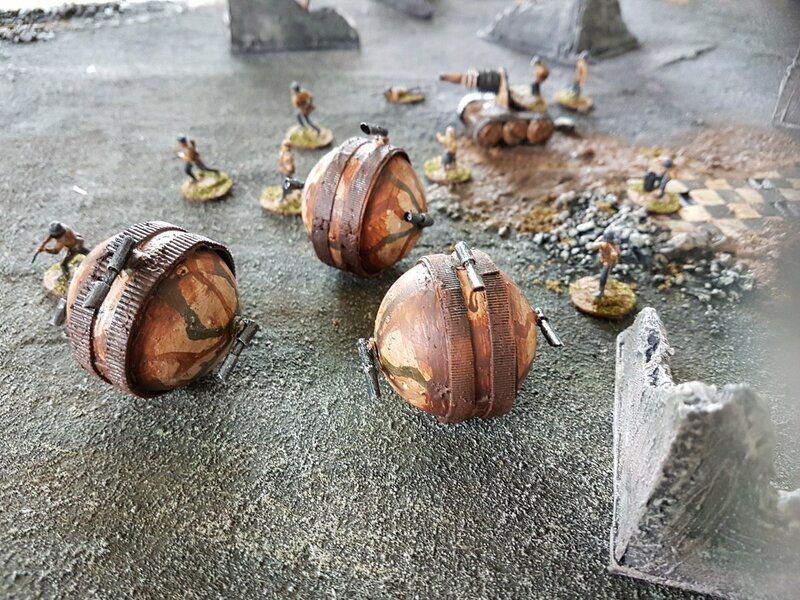 So courtesy of dakkadakka.com I stumbled across what looks to be a very promising Kickstarter skirmish game, “This Is Not A Test”. 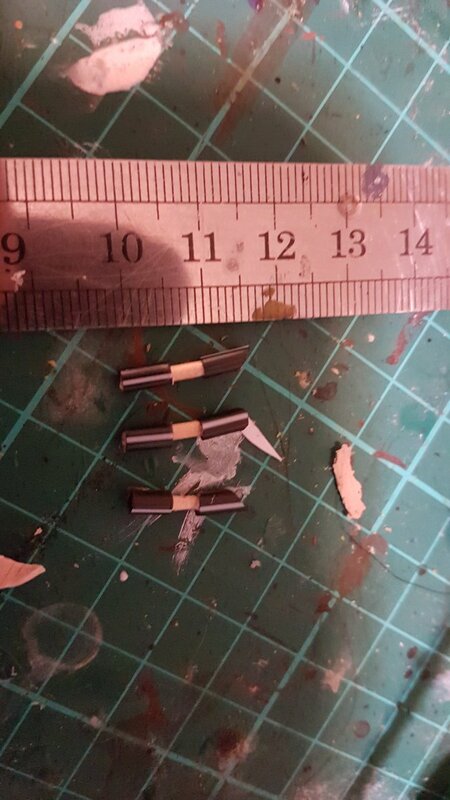 I checked out the blog and the first entry was about being “miniature neutral” – how you can use any type of miniature to play the game. Very laudable, and it got me thinking. 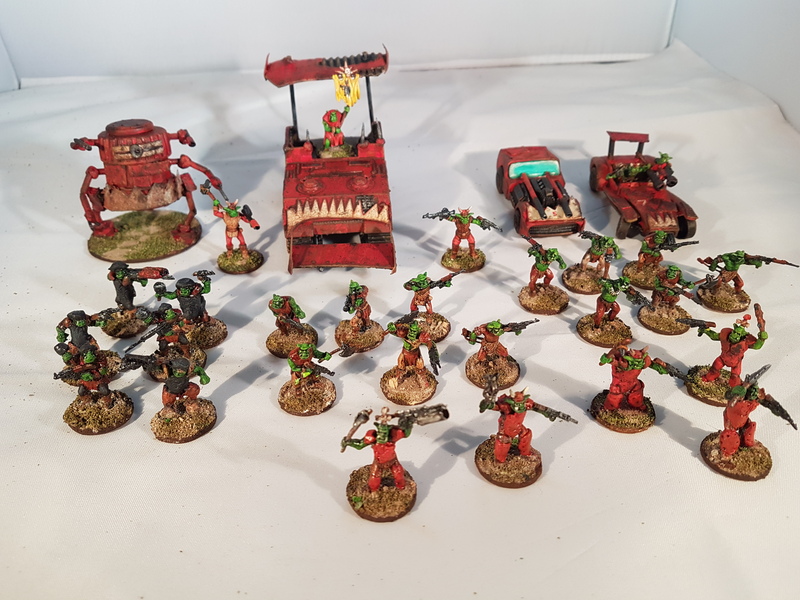 I designed Apocalypse: Earth with the intent of creating a fun, fast paced game which would be simple to learn but difficult to master, and to keep the associated costs down by using 1/72 scale plastic soldiers. 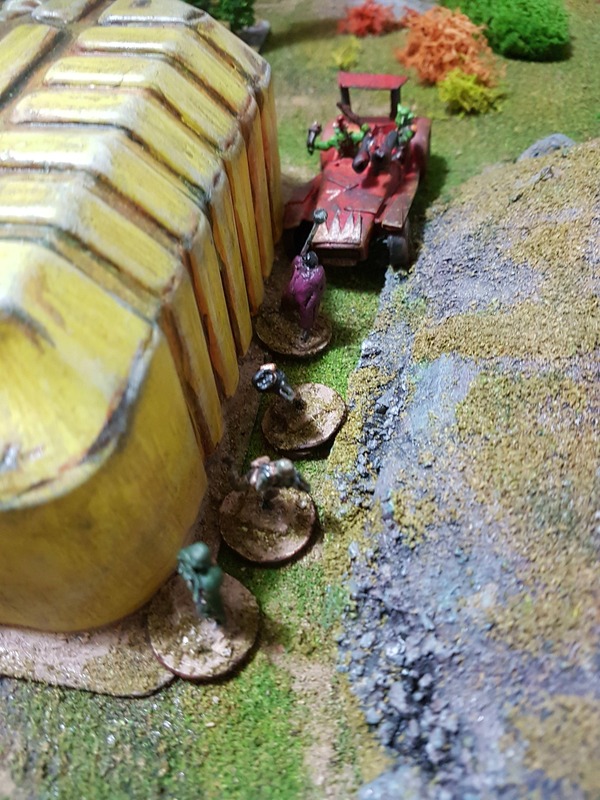 Latterly our gaming and development group has stumbled across the medium of papercraft, which has enabled us to field a raft of vehicles built at practically no cost. The connection? 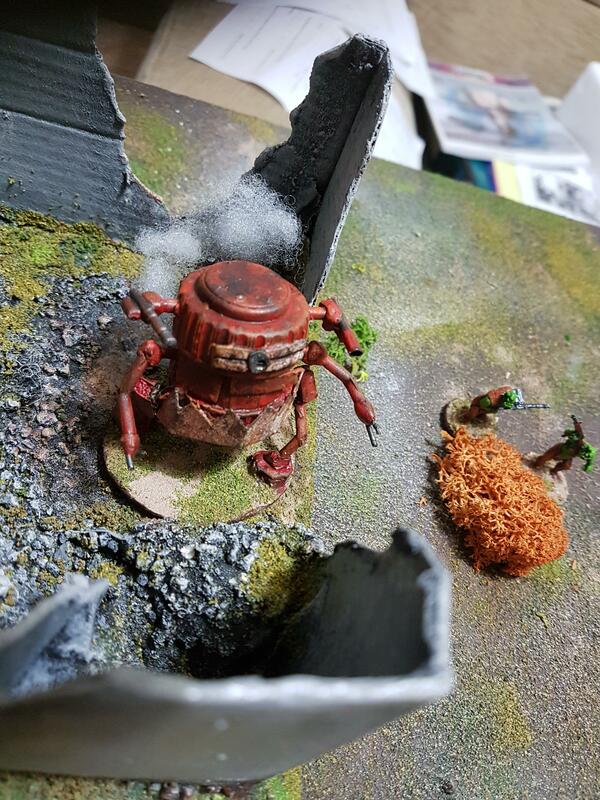 A:E does not feature prescriptive miniatures, and we positively encourage conversions and creations through the player’s own ingenuity. There is a whole planet, tearing itself apart through a bloody conflict involving many strange and unnatural technologies! That said, being set in an alternate 1950s allows the base of WW2 tech – helpfully, the most well catered for time period of all! 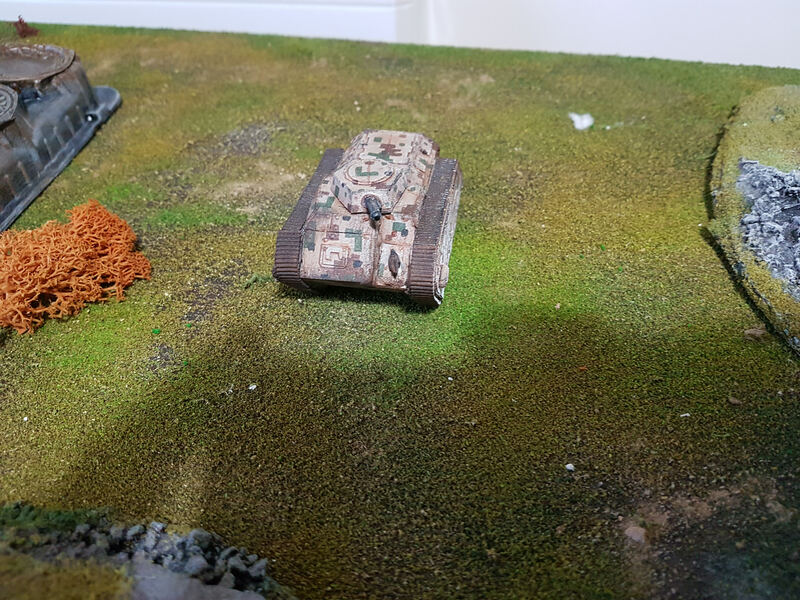 To give you an idea of what’s in our studio armies – the Holy Soviet Empire are represented by WW2 Red Army, with the T-48 workhorse a conversion of a T-54 papercraft, the League Of European Nations represented by WW2 Germans (Cougar MBT is a converted King Tiger papercraft). The Atlantic Alliance have received a tech level boost from the Roswell crash so I’ve used Vietnam War US infantry to represent them, but the background is flexible enough to conceivably include WW2 US, WW2 Brits, 1970s/80s/ Present day Brits, and their workhorse MBT is the M60A3 Centurion – armour enthusiasts will recognise a portmanteau of two iconic cold war tanks. 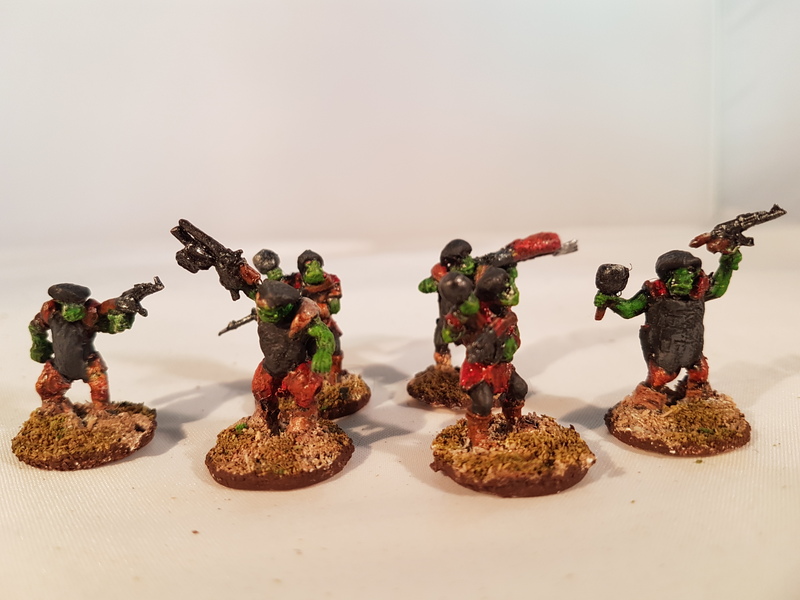 Taking things to the extreme, the Holy Soviet Empire has it’s elite, genetically modified “Strong Men” Siberian assault troops – represented in the game by Caesar fantasy Orcs, while the Atlantic Alliance elite Dreadnaught squad are US Vietnam infantry converted with greenstuff and cardboard… I look forward to seeing what more skilled modellers than me can achieve!